The kids were so excited to get out of school and have “nothing to do”, but after a few days of “nothing to do” they started complaining of being bored. I remedied that by giving them lists of extra jobs they could do whenever I heard complaints. We did have some unseasonably warm weather, so they enjoyed some outdoor time. We started a new tradition this year of having the kids draw names. We got tired of having 16 dollar store toys break on Christmas morning. We gave them each a few dollars and had them do some extra jobs around the house to earn the rest. That way they were able to get something nicer. I was tickled by their excitement at buying gifts for each other. It really seemed to mean something more this year. We also started a new tradition of reading a Christmas Advent story each night of December until Christmas, thanks to some books sent by the Grandmas. That really helped to keep us focused on the meaning of the holiday and was something we looked forward to each night. Christmas Eve we read our final story (Luke 2) and acted it out. Then we each opened one present and headed over to our friends’ house for their traditional Christmas Eve pajama party. After that we had the 3 older kids help us play Santa and then sent them off to bed. Christmas morning was fun. We kept things very simple this year and I was a little worried the kids might notice and feel disappointed, but they each were thrilled with what they got. We spent the rest of the day in our pajamas relaxing and enjoying our gifts. We talked to some of our family on the phone and ate way too much. And I took some photos. It was awesome! A few days after Christmas we drove to Michigan to visit with Derek’s sister and her family, his brother, and another sister and her husband. We were grateful for good weather and a quick drive with all the snowstorms they’ve had recently. Our stay in MI was awesome as always! We were invited to dinner one night with some friends who used to live here but moved to MI and really enjoyed seeing them. The kids didn’t want to go. We were spoiled by our family with wonderful food and great company. 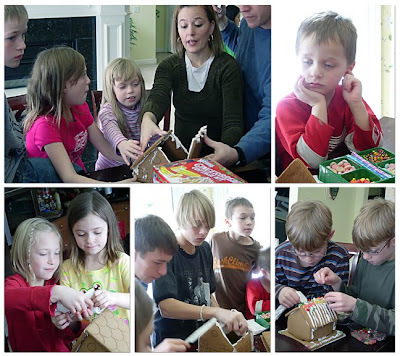 We enjoyed sledding, several games, and the cousins had a great time playing Wii /Webkinz, and making ginger bread houses. One of our favorites was being introduced to the “flour” game—a tradition from Derek’s family where you place a packed cup full of flour upside down on a plate and place a penny on the top. Everyone in the circle takes a turn naming something in a certain category to a specific rhythm. If you break the rhythm you have to slice some of the flour mound with a knife. The game ends when the mound collapses and the penny falls. Too fun! The drive home went smoothly as well, though there were a few tears shed by the girls at being separated from the cousins for another year. We’re so blessed to have such gracious and generous families and we always enjoy seeing them. Derek got a watch, an atlas from the kids to replace his stolen GPS, a DVD, some chocolate (which he shared with me…isn’t he good?? ), and some money for tools. He got a paper accepted to a cardiac conference in Orlando, FL so guess where we’re going in the spring?? James & Jeffrey had a rockin’ 11th birthday party—paintball with 4 of their friends. Derek borrowed some equipment from his buddies and took them to our friend’s property. They had a great time, though actually getting hit was a bit of a shock for a few of them. For Christmas James got bakugan, a new book, pj’s, and a watch. Jeffrey got a hot wings airplane, some more runway for his airport, pj’s, and a watch. From grandparents they got a 3 foot long model of a t-rex skeleton. Ashley got strep (from Jeffrey who got it in MI) and missed the first day back to school. She’s much better now. For Christmas she got a Barbie Peek-A-Boo, a Littlest Pet Shop virtual pet, a watch, and a new dress. From grandparents she got a crystal making kit. Lexie surprised us by hanging out with her 12 year old cousin more than anyone else in MI. Her cousin was a great sport! She got a Barbie Peek-A-Boo, a Littlest Pet Shop virtual pet, a diary, and a new dress for Christmas. From grandparents she got a notebook and a rainbow maker. Well, that’s all for now. Join us next month for another exciting edition of our family update! Wow Aly you were seriously busy!!! I am so happy that you had a good christmas and a family visit. You deserve it.